WORT’s locally focused news show “In Our Back Yard”airs live from the Goodman Center on Tuesday Sept. 28th, 6:30-7:00 pm. This show is one in a series of live broadcasts from local neighborhood centers. 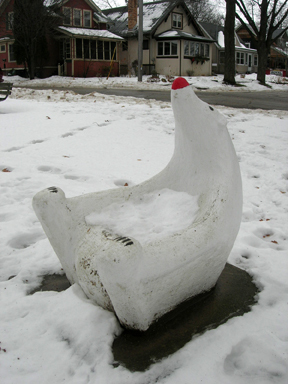 This Tuesday Curt Martin, owner of Martin Glass, will talk about his friend Sid Boyum, the eccentric artist who created sculptures now found around the Schenks-Atwood area. There will be room for a small audience at the Goodman Center and snacks on offer. Come on down and join the conversation! Follow this link to more photos of Sid Boyum’s sculptures. 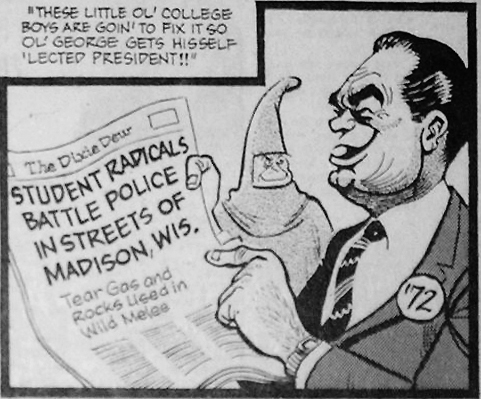 Twin brothers Art (the editor) and Ed (the artist) Hinrichs produced “The Week’s Roundup” editorial cartoon for the Capital Times from February 1959-1972. Susan (Hinrichs) and Rob Anderson will share their collection of the Hinrichs brothers’ cartoons. Relatives of the Hinrichs family will talk about their lives and work. Come share your memories related to the events covered in some of the cartoons.